Busy Saturday for the team with 6 runners. Its a busy day for the whole team here at Stockton Hall with 5 runners under rules aswell as Ed running Court In Matera at Chaddesley Corbett. Kikimora gets the day started in the 3:20 at Bangor, hopefully the better ground will help her see out her race and the application of a visor will help her show more promise today. We then move on to Helf who will be making his handicap debut in the other division of the handicap hurdle. We think that the step up in trip will suit and hopefully slightly better ground will be in his favour. Dave England partners them both. Touch of Steel will be looking to bounce back from a disappointing effort last time but is in serious form at home so we are hoping for a better effort from him. We feel Jamie Moore should really suit him. Our final runner at Bangor sees Twotwothree run in the concluding bumper on the card, he has shown solid form in 2 starts since joining us and we are expecting a good effort today. Rob Hawker rides. 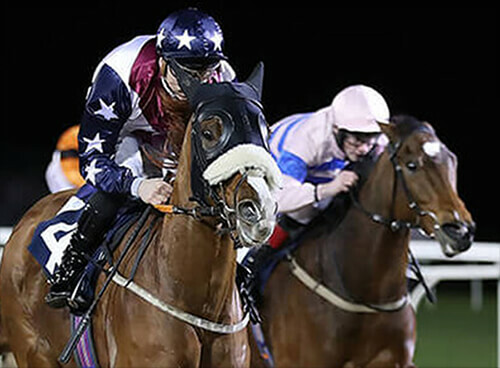 Rock Warbler runs at Wolverhampton again tonight and whilst he will still come on slightly for the run he seems in good form at home and we are hopeful of a solid effort. William Carson will be aboard tonight. Eds only runner at Chaddesley Corbett sees exciting 4 year old Court in Matera make his debut in the Maiden, his homework has been good and we are looking forward to seeing him on the track. Its good to get Tommy O'Brien to ride.